The Truth is Revealed | 2P START! Ray spend a lot of time on this one, so I hope you all like it. Of course, if you haven’t seen the movie ‘300’ (like myself), you probably won’t get the full effect, but you get the idea. When Chris Hecker apologized last week for the comments he made about the Wii, there were only two possibilities. First, EA and/or Maxis were not pleased with what he said and forced encouraged him to apologize. This was actually my first thought and was the original idea behind our comic. I thought we could show how ‘genuine’ his apology was with some corporate bigwigs standing behind him as he made the apology. The second possibility was that someone paid him off or threatened him with violence to get him to retract his statements. This wasn’t a realistic idea, but made for a great comic tie-in to the just-released ‘300’ (which Ray had just seen). I came up with a logo for the comic that we decided not to use, but here’s a crude mockup if you’re interested, see if you get it. Anyway, give us your feedback on the comic, we’d love to hear what you guys think. Great Comic, this is what makes my day. Awesome! I just saw 300 the other day and this is a great spoof. And I especially love the “Wii-hundred” logo. Keep up the good work guys! Yeah, good job guys. The Wii hundred logo is worth doing something with. Thanks JQ! I saw someone on the IGN boards take it and make it a Wii360 logo which I thought was pretty clever. Fantastic! Keep this $@!# up. hahah! 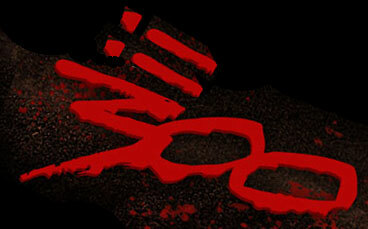 love the wii-ed 300 logo! the wii logo is really clever!!! so i’m guessing miyamoto is xerxes? you misspelled piece. you put peice. Y’know, I’ve tried with all my might to get the joke with this comic, but I haven’t been able to. XD Lack of 300 maybe? And why am I still posting comments on old comics? I like the mock-up logo. The comic is funny too! The 5th pannel Looks Kinda…. Bad.. a Little Perverted.